You can invite someone into your heart and not into your house. This is something that is essential to learn and grasp completely. You can open your heart to someone without opening your house to them. You can open your heart and treat them with kindness and compassion without allowing them to have a position of influence in your life. This concept is one that is frequently misunderstood. I’ve briefly touched on this discussion before. Many people mistake having compassion for someone as a weakness, especially if that person has a negative history with you. I have a Buddhist friend that comes from a difficult childhood. In adulthood, she has created many boundaries of just how much certain family members are invited into her life. She has very clear boundaries about how much contact and what type of contact there will be. This does not mean she does not treat these family members with kindness. This does not mean that she does not hold compassion in her heart for them. It does, however, mean that she sees and knows what she needs to maintain a balanced and happy life and reduce the suffering that can be caused when her house has an open door to these folks. She does not judge them or criticize them. She accepts them as they are and with that acceptance come limits as to how much access they have in her life. I think what she is doing is difficult. Everything in our society is pointing her to either have them in her life running willy nilly or to cut them off completely. We can carry this lesson into our work lives. Let’s face it. Sometimes, we work with toxic people. I have worked with and for people who yelled, threw things, looked the other way when really horrible things were happening, polluted the work environment with their constant stream of negativity and I have worked with bullies. I think the negative folks and the bullies are the most damaging and dangerous to work culture. Every place I have worked had at least one negative person who spent a good portion of the day complaining about something. I find these folks extremely damaging to morale and general work atmosphere and I think they should be stopped and if that is not possible, they should be highly discouraged. The funny thing about complainers is if no one listens to them spewing their negativity, they spew less and less. I have seen this happen. They need an audience; but, we don’t have to give them one. The first time I boldly told a person that I didn’t want to participate in a conversation, my hands were shaking. It is hard, especially because most of us like to avoid confrontation. By letting these people go on and on unchecked, we are letting them into our houses. We do not need to do this. You can be kind and compassionate and still limit the contact you have with certain people at work. You can be kind and compassionate and still confront the person if they start a conversation that makes you uncomfortable. In fact, confronting them quietly and calmly is far kinder then just ignoring them, avoiding them or letting them go on and on. I know it’s difficult. I still find it difficult. Use phrases that are very clear and finite: I can’t participate in this conversation. I feel uncomfortable talking about a coworker behind their back. I’d rather not have this discussion. I don’t want to hear this (said when I had to share an office with several people and two coworkers were bad mouthing our boss). We can’t bar toxic coworkers at the door; but, we can set clear limits of how they can interact with us. We can be kind and compassionate and still not invite them into our house. When I was a kid, I remember a lesson in school where we were taught about optical illusions. Pictures that at first appear to be one thing; but, when you look deeper are also something else. 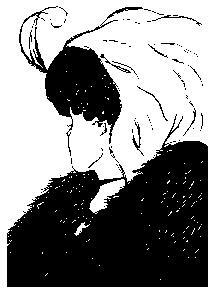 The old lady / young woman drawing is probably one of the most commonly viewed. I was awed by that lesson. I suspect that it, although such a small lesson, helped nourish a seed in me to always be looking for hidden depths, alternative views and just different ways of seeing something. It helped me know that sometimes what we are seeing is not the only way to see something. There is such value in looking at the world this way. It opens your heart and it fosters good ideas. I ran across a story about a program to bring groceries to people who live in areas of Baltimore that are not served by a grocery store. The Health Department and the Enoch Pratt Free Library have teamed up to help residents gain access to affordable, healthier groceries. They are using the library as a place where people can order the groceries online and then the next day they return to pick up their groceries. Health Department workers are on hand to help residents navigate the grocery store’s website. This is brilliant. It is such a ridiculously awesome idea for so many reasons. On the library side of things, it reinforces the library as community center. It gets people to the library that might not have been familiar with all the library’s resources and services. It also reinforces the relationship between the library and the folks it serves. The program gets the library in the news in a positive way. And it’s just a feel good story all the way around. On the community side people who live in these grocery deserts now have options beyond the mini mart and corner store. The folks using the program will have access to healthier, less expensive food and won’t have to pay delivery costs. 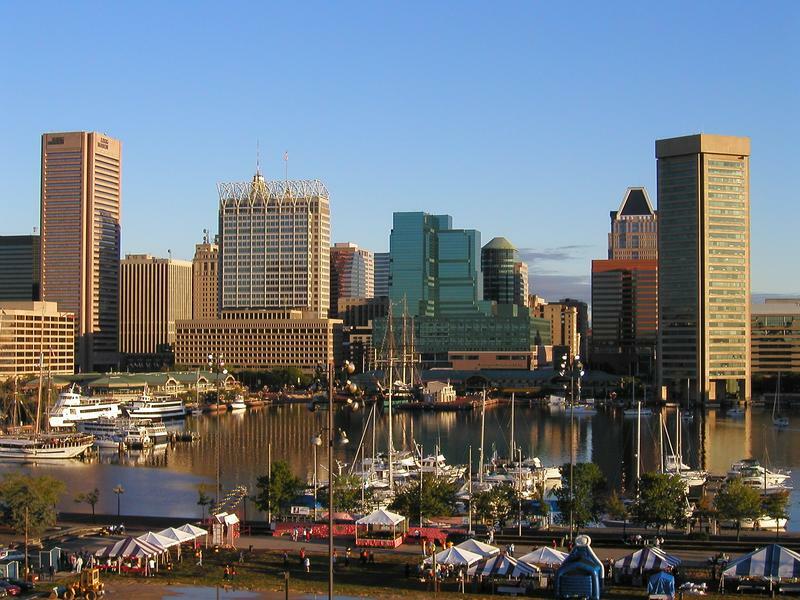 Baltimore had a problem: areas of the city where the residents did not have access to regular groceries stores, which basically means they didn’t have access to good, fresh, healthy food. Someone or a group of someones turned that problem upside down and inside out, looking at all the ways the problem could be solved. I’ve lived in cities where access to grocery stores was limited (Kansas City, KS and Pittsburgh) and most of the problem solving efforts were focused on trying to get someone to open a store in the neighborhoods lacking grocery stores. This, of course, is a good idea and solves the problem; but, in the couple years I spent in each place they were unsuccessful in accomplishing that goal. I’m sure Baltimore is also trying to get someone to open a grocery store in these areas. But they didn’t stop there. That is a long range goal. It could take years and years to accomplish that goal; but, the people need to eat now. I’ve always been a fan of turning a problem over and over and all around to see it from every angle and every side and think out every solution, even the absurd ones because maybe they aren’t THAT absurd. The phone’s have been ringing off the hook from other cities that are thinking about copying the idea. I applaud the thinking outside the box and the teamwork involved to get this program up and running. Kudos to you Baltimore. 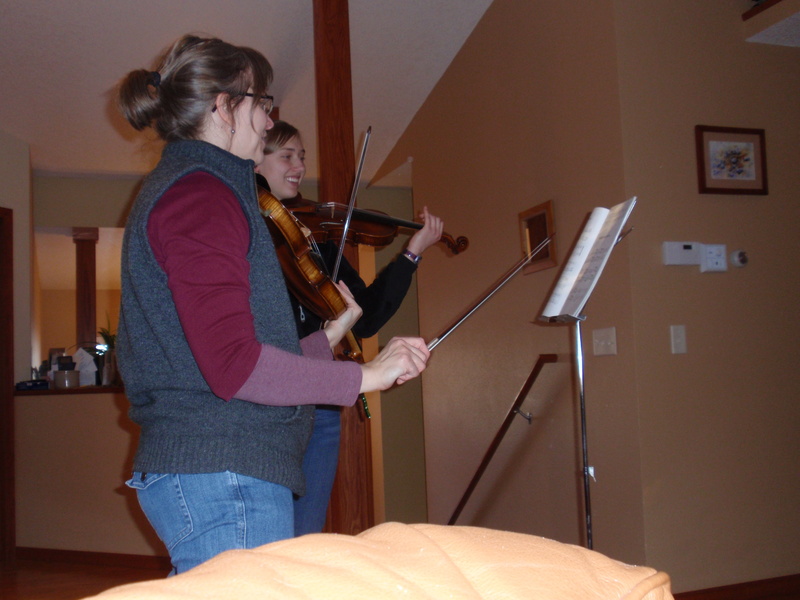 Lauren listens good naturedly through my pointers during a non-recital related jam session. A few weeks ago, I went to my niece’s violin recital. Lauren is a willowy mellow musical 17, but her teacher takes students from ages 5 on up, so the program would feature many skill levels. Our family arrived early and so we spent quite a few minutes waiting for it to start. I looked around and eavesdropped (I’m an introvert and eavesdropping is the carrot that brings me out in public). No matter what they were talking about, people were looking to the door where the performers would come out to the stage. Finally the door opened and the audience drew in a collective, calming breath. The first student was a little girl. She carried her half-size violin (Ever seen one? Cute as a kitten) awkwardly. Little coos, sounds you make to a kitten, came from all over the audience. Either her family had planted itself apart for some reason or many people were charmed by her. The teacher, who hadn’t looked like King Kong until that moment, took the half-size violin and put it on her shoulder to check the tuning. People checked their programs, whispered, pointed and I was enveloped in a cloud of positive anticipation. Of course she played Twinkle Twinkle Little Star. Of course she did. Of course it was squeaky and somewhat scratchy. Then she burst into a huge grin. And I knew with absolute certainty who her people were, and not just because of the familial eyebrows. But we were all her fans. Her family clapped the loudest, but we all clapped hard. And the cloud was now one of positive relief. She had done it. And think of how much we, the audience, helped. I wasn’t just being polite, clapping for this little girl, hoping her family would clap at least as hard for my niece. No, I was Recital Nice. I assumed the best intentions of each violinist. They weren’t going to step out on stage and try to sound terrible. They may have flowed to this evening on various currents of willingness, but now that they were here in front of me, I could help them and I hope I did. I wish I could be recital nice without thinking about it. I wish I could always, on the most basic level, assume best intentions. We are all here, jostling into each other on the planet. But too often, I’m just in my bubble, worrying about if I have the right change for the bus or remembered my lunch. When I get to work and the phone rings, am I automatically ready to help whoever is on the line? Am I willing to assume their best intentions? Do I assume my own best intentions? I will try. The next time I know I’m losing perspective. I will close my eyes and conjure up Twinkle Twinkle Little Star played very badly and very sincerely.